NBA Finals: Who's better, LeBron James or Kevin Durant? (CBS/AP) The season started with 30 teams, got whittled down to 16 and now there are two  the Miami Heat and Oklahoma City Thunder, set to begin the NBA finals on Tuesday night. LeBron James in his third finals. Kevin Durant in his first. One superstar set to get his first ring. WHO'S BETTER, JAMES OR DURANT? Flip a coin. Kevin Durant is a three-time scoring champion. LeBron James is a three-time MVP. And this series probably won't decide if one individual player is better than the other, either. They'll be matched up against each other at times in this series, and everyone wants to see the 1-on-1 fireworks. Sounds like the only people not wrapped up in the whole KD vs. LBJ matchup are, well, KD and LBJ. CBSSports.com's Royce Young says that as Durant was drilled with questions about LeBron, what he thinks about playing him, the size of the matchup or even past one-on-one Finals matchups he remembers, he woudn't bite. He stuck to form, played it cool and never stepped out of character. 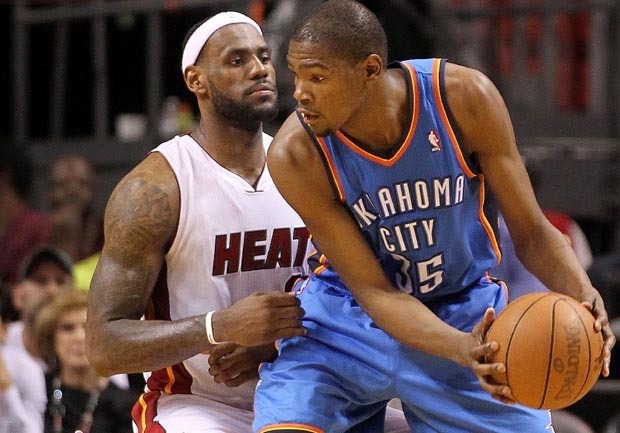 "First, all I think about is the Thunder versus the Heat, that's all," Durant said. "I know everybody in here is worried about the one-on-one match-up, but I can't really control that. All I can control is how hard I play and how we play as a team." "I mean, that's a sexier match-up, I guess," Durant continued. "But I don't read newspapers, I don't get on Twitter anymore, I just focus on what I need to do and what we need to do as a team. To be honest, really, outside of me knowing what you guys are thinking, that's all I've heard about the match-up is from you guys." CAN LEBRON SILENCE HIS CRITICS WITH A WIN? Not all of them. Look, no matter what James does  wins a championship, wins a Nobel Peace Prize, never wins another game in his life  he won't silence everybody. He will get plenty of credit if the Heat win this title, and rightly so. It also could be a relive-the-nightmare scenario for Cleveland. It was hard enough for Cavaliers fans to watch James leave. Just imagine how hard it'll be for them if James hoists the championship trophy wearing another city's uniform. ARE THE THUNDER READY FOR THIS? Sure. Same could have been asked about Miami in 2006, when yes, the Heat had veterans like Shaquille O'Neal and Jason Williams and Gary Payton and Alonzo Mourning and Antoine Walker. But the guy who made the Heat go in that championship season was Dwyane Wade, who was 24 when he carried Miami to the title. Kevin Durant is 23. Russell Westbrook is 23. No, neither has been on this stage before. But they handled being down 0-2 to San Antonio. That's proof enough of what they're capable of doing at this time of year. "We're not here just to be here. We're here to win a championship," Thunder coach Scott Brooks said. Young says the Thunder don't think they are too young or inexperienced for the NBA's biggest stage. "You can't hide age and the Thunder are certainly a bunch of kids, at least in terms of traditional NBA powerhouse teams. But they don't act their age, either on the court or off," Young writes. WHO HAS THE BETTER SIXTH MAN? Well, that's an easy one, since Oklahoma City's James Harden is the premier sixth man in the NBA right now. But it may not be as one-sided as many would think if Miami continues using Chris Bosh off the bench. Bosh  who missed nine playoff games with a strained lower abdominal muscle and has been a reserve in each of his three appearances since  said last week that he isn't counting on starting again this season, and the Heat have raved about what he's been able to do with the second unit. So Harden may have some competition after all. WHAT'S UP WITH THE POSTGAME OUTFITS? The glasses-without-lenses that LeBron James and Dwyane Wade have been wearing, they're one thing. But seriously, the shirts that Russell Westbrook has been putting on before he goes to postgame news conferences look like they were designed to go with Rodney Dangerfield's pants in "Caddyshack." It's like the postseason has been one long tribute to Steve Urkel or something. The fascinating part of the outfit craze is that Twitter is burning up after games with people trying to figure out where to buy the stuff. WHY NO TWITTER? LeBron James hasn't tweeted since April 27. Kevin Durant hasn't tweeted since May 1. In a word, it's about focus. Playoffs are hard enough without distractions like 4,784,446 followers  James' total as of Monday afternoon  asking you for a retweet. One of them will tweet in a few days as an NBA champion. That's enough for them. SHOULD THE BEARD BE FEARED? James Harden has unbelievable amounts of talent. He's best known for his mohawk-and-beard look. And one of the gripping questions entering this finals matchup got an answer Monday, when Harden was asked if he would be sitting down with some clippers at the end of the season. "The beard's going to stay. Win or lose," Harden said. WADE VS. WESTBROOK? Assuming that LeBron James and Kevin Durant put up similar numbers in the series, maybe one key element in deciding this title will be how Dwyane Wade and Russell Westbrook perform. Wade raises his game in the NBA finals, and for whatever reason, Westbrook has struggled against Miami  though that was news to Wade. "Russell Westbrook is what makes them very special," Wade said. Yes, but Westbrook has shot just 30 percent in his last five games against the Heat. If Miami figures out a way to keep him from getting rolling, and if Wade turns in another finals-MVP-type showing, the Heat will have a huge edge.